DARIEN — Sarah Jaques called it a perfect storm. Ashley Humphrey said it was a total team win. 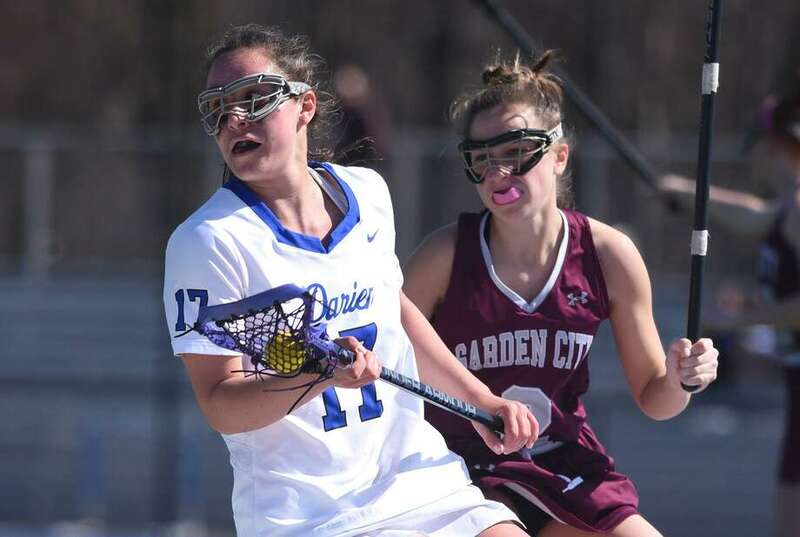 Whatever the description, one thing is certain: The Darien girls lacrosse team’s performance on Saturday was simply dominating. Led by eight goals from Jaques, the Blue Wave steamrolled over the Garden City-New York 19-4 at Darien High School. Darien had eight players find the net, 11 of the goals were assisted, and the defense was on point to complete the picture. Wave senior Mason Maloney scored the game’s first goal 36 seconds after the opening draw and Darien held the lead the rest of the way. The Trojans’ deficit was 5-3 with 16:05 to play in the first half, but the Wave outscored Garden City 14-1 the rest of the way, scoring eight goals in the second half. Ashley Humphrey had three goals and three assists; senior co-captain Nicole Humphrey had two goals and two assists; Maloney had a goal and three assists; senior co-captain Katie Elders had two goals and an assist; and senior co-captain Shea van den Broek had one goal and one assist. Junior Maddie Joyce and sophomore Nelle Kniffin each had a goal. The Wave also had a huge game from Dolce, a freshman who has taken over as the starting goalie. She collected eight saves on Saturday. The Blue Wave have several other out-of-state games on its schedule this season, including a road trip to take on Manhasset, the nation’s top-ranked team, on May 2. Sarah Jaques, Darien. Jaques scored eight goals and had two assists in the Wave’s tour de force. Five of those goals came during the first half.